This Dallas building, 1717 McKinney, has been purchased by Gaedeke. 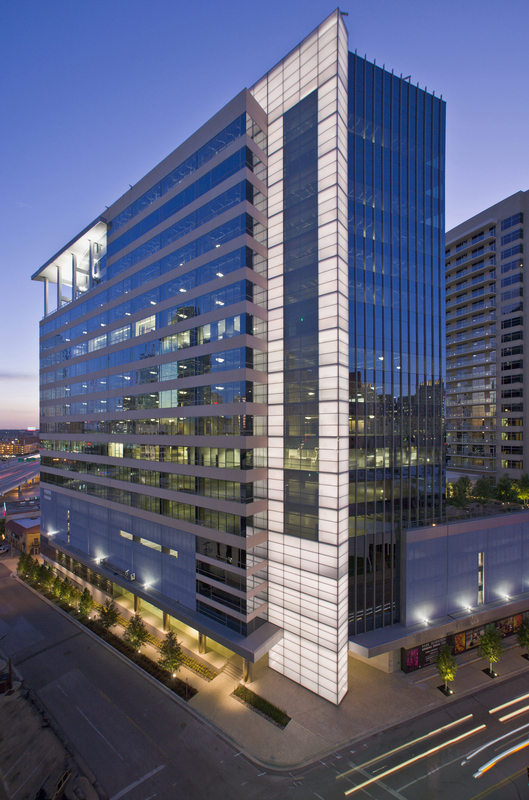 DALLAS – Gaedeke Holdings XIV of Dallas has acquired 17Seventeen, a 19-story office tower in the Uptown/Turtle Creek market near downtown Dallas. The 369,000-SF tower, which opened in 2010, fetched a sales price over $500 per SF. The seller was a joint venture between Granite Properties Inc. and MetLife. The office tower, 1717 McKinney Ave., is near the popular Klyde Warren Park, which was built over a depressed section of the Woodall Rodgers Freeway. Deck parks, built over depressed roadways, have become a trendy public park development and one is being considered in Houston, near the George R. Brown Convention Center. “17Seventeen’s exemplary design and location are a natural fit for our investment repositioning,” says Glenn S. Lickstein, president of Gaedeke Group, LLC. 17Seventeen was designed by Good Fulton & Farrell of Dallas, featuring 361,524 sf of class AA office and 7,493 sf of retail space. “This building is pure quality – every box has been checked.” says Belinda Dabliz, Gaedeke Group’s vice president of leasing. Among its innovative features, 17Seventeen has a 17th floor balcony with breathtaking views; a seventh-floor amenity level with a conference facility, 4,000-sf fitness center and outdoor pool; and a parking garage for office tenants and residents of the adjacent Gables Park Seventeen. The multifamily development was not part of the sale. Regions Bank is one of the building’s largest tenants, occupying two floors of office space plus providing the property with an on-site full-service bank with two drive-through lanes. Tucked into the Lower McKinney Avenue neighborhood, 17Seventeen offers immediate access to the Woodall Rogers Freeway, the Dallas North Tollway, as well as Interstate 35 and Central Expressway. Close by are three light-rail stations and the “M-Line Trolley.” And if a $40 million proposal to extend Klyde Warren Park comes to fruition, 17Seventeen will be on its doorstep.